TL247SN-RC /TL256SN-RC is used in school and small printing factory widely. It's for the task as exam papers, lectures, receipts, flyers, bills and non-setting adhesives and so on. 1. Easy operation: Water feeding, ink feeding and impression are all operated by one switch dividedly. The impressing roller on/off is controlled by electric eye accurately and reliably. 2. Precise location: Front guide, side-pulled-guide, feed-table tune-up, plate tune-up, ensure locating precision of paper sheets and perfect printing results. 3. Separating damping from inking: Dampening system is separated from inking system. It can adjust damping and inking flexibly, which can content the request of different prints for water and ink. 4. Presetting counter: It adopts electromagnetic presetting counter. If the printing of presetting finish, the input stop automatically. 5. Overlap detection: It can exclude the trouble such as overlap and non-stoped printing. 6. 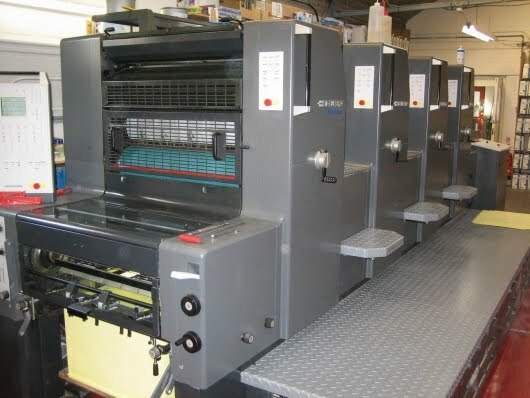 Circuit control: The whole machine is controlled by PLC Computer, with the function of stoping printing automatically when paper blocked. 7. Satellite two colors system: The 2ND color-head likes a satellite to the main color-unit, which is suitable for signature and double colors imprinting, enlarge the using area of the machine. There are 11(2 forme) inking rollers and 4(1 forme) watering rollers. 8. NP-system: Which have the function of printing number, perforating line, resin-plate printing and signature imprinting. PS-plate, zinc oxide plate and watre form plate could be used with this machine. Withe the advantage of reliable quality. Easy adjustment and operation. This machine is one of the ideal equipment to be used for good quality quick printing. Typical print jobs include classical economical work such as forms, little newpapers, cards, Propaganda Posters and so on. 7. NP-system: Which have the function of printing number, perforating line, resin-plate printing and signature imprinting. -Automatioc shutdown display for paper double-feed, Paper jam, out-of-paper, paper tray full. Machine automatically stops when the number turns to zero. The collating machine counts forward until all printed sheets are completely collated. Error display paper double-feed, paper jam, out-of paper, no paper, deliver tray Full, Paper miss-feed, back door open.